i watched irene come rolling in from the south via twitter and i was getting pretty antsy. since i knew we were safe i was sort of hoping for a little stormy show. maybe some loud rain to fall asleep to. instead, we got some quiet rain overnight, a few leaves on the sidewalk in the morning, and a new pond in central park in an area where there used to be just grass. we stayed inside and played it safe and watched mad men online with the rest of new york (the server was so overloaded we only got every third frame and so it was like watching all of sterling cooper doing the robot), and then we got bored and decided to venture out for a careful walk, to see who all was brave enough to be open. (our neighborhood chinese place made a KILLING, they were open both days, and packed every time we walked past). did i mention we watched wayyy too much mad men over the weekend? i'm thinking of bringing back the pin curls, betty draper style. I love Mad Men. I would say I dress more like Betty, but I act more like Peggy. I'm a copywriter at an ad agency, so... yeah... Peggy all the way. Like you, my hair doesn't hold curls; I need LOTS of hairspray. xo. Oh my gosh, I LOVE Mad Men. My Hubby and I just started watching and its a total guilty pleasure. One thing I love most is the ladies attire, so stunning and retro. I want a majority of the dresses they wear! Told you not be scared of the hurricane (but am SO GLAD it was nothing.) Every time I see a woman wearing red lipstick as of late, I think "she must be watching Mad Men"!!!! And you've got the coloring for it, you lucky duck. I would totally bring back the pin curls with you. I love the style of Mad Men. However, the show itself?? I watched season 1 and I missed where it was good. Just really boring. I would give season 2 a go if someone told me it got better. Looking at these comments, I clearly missed something. hmm.. i'm a mix of peggy's sensibility, betty's b*tch*ness and joan's behind. ps. i love mad men, but don draper is a total scumbag. i kind of can't stand him. one of the nicest compliments someone ever paid me is that i was "joan meets peggy"
i too re-watched almost the complete first season this weekend while hiding from irene. (i was a bit disappointed as well, though i did get to work from home today due to storm-related issues). One time I wrote on my blog "mmmm Don Draper... You can chest on me any time! And my hubs got super ticked. Is that not just rude! I moved into my new mad men Sterling Cooper house today. It was built for a football couch's wife in the late sixties and I've heard their parties were legendary. I've decided to bring back the red lipstick, betty's bob and block parties. But Betty is the worse mother ever!!! I'd like to think I'm the fun neighbor with the good marriage that is gossipy but in a fun neighbor sort of way. And she voted for Kennedy! My parents are totally into "Mad Men"--is that not hilarious?! Jim loves it for the cool retro vibe, and my mom loves it in spite of the rampant sexual inequalities that always tweak her! Jim said she was fuming during the first episode or two, and then totally capitulated and loved it. I myself have never seen it. BUT I think everyone can wear red lipstick! Just scoot yourself on over to the MAC counter and have them match your shade. They one they picked for me was more pink than orange, and it looked FAB. And I totally forgot the name of it and ran out long ago. But even if your shade looks more pink than a "true" red in the tube, it'll look so fab on you, everyone will just think "RED!!!" (And if you buy a true red and it doesn't match your skin tone, you'll just look like a clown no matter HOW sassy it looks in the tube. Darker is better, too.) P.S. I totally heart pin curls myself, though a) I get a crummy night's sleep in them and b) they fall out after three hours no matter HOW long they've been in!!! I'm definitely a Peggy. Unfortunately, my hair is the flattest of the flat, so I won't be able to join your newly established Pin Curl Club. But you go, girl! I don't think ive ever left a comment, but I read your blog all the time. That's kinda rude eh? Anyways I had to comment today because my husband and I just started watching Mad Men and I love t! I want Betty Drapers wardrobe, so bad! Yes, yes, YES! I will totally do that with you! So glad you guys were spared the bad parts of the hurricane. We were supposed to visit the city on Saturday and had to cancel! Luckily, we rescheduled and are trying to go this wednesday! Can't wait to see the Upper West Side! You look super cute with the pin curls and lipstick, and the hair scarf! I was wearing hair scarves all summer to combat growing out my super short hair, they are very retro cute. Post-Irene rocked. I took a devastation tour with a Fat Rat, her Holbs and the chubs in Central Park. I haven't watched Mad Men, so you'll have to tell me: Am I a Betty or a Joan? And what exactly would that mean? Glad you made it through safely and that your area was good. When I watched on the news parts of New York got flooded. Carolina got it the worst. If you do the pin curls do a tutorial or something would love to do it to my hair. Love the 50s and early 60s style. I also went two weeks straight watching all of the mad men episodes. I didn't do anything, nothing but lay in bed and watch mad men. Its pretty addicting. yes, i'd love to come to lansky's with you. thanks! Peggy is the best female character on Mad Men. She is kind & successful. It is definitely a compliment. Why would anyone want to be compared to Betty or Joan? Betty is a terrible mother & Joan is just mean. I'm on the west coast, Portland to be exact, so no hurricane action here! Although I've had my fair share of hurricanes, I originally hail from New Orleans. I'm glad you guys faired well with the storm, they can be pretty awful. 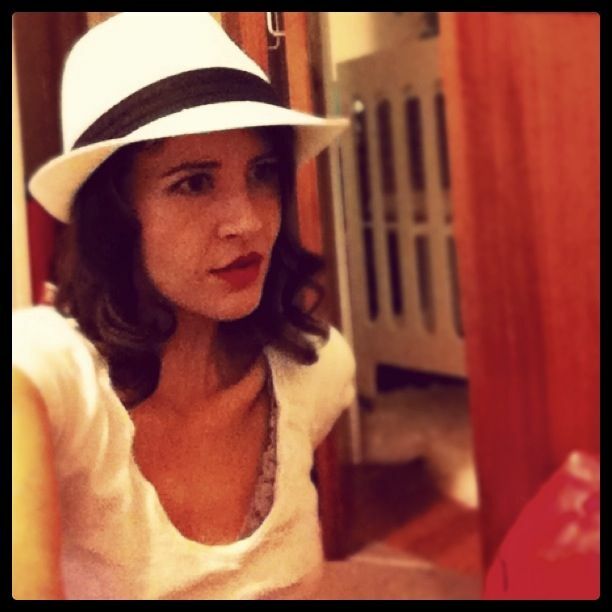 On the topic of Mad Men, I'm a Joan. I've had the red hair for the last 9 years, and I did dress up as Joan for halloween 2 years ago. That same halloween the hubs dressed as me dressed as Joan. And he has a beard so it wasn't very pretty. Anyhoo, I love your blog and I catch up with you on Babble as well (I have a 5 month old monster boy). 1. I've never watched Mad Men, but I might start. 2. Your Huck is so delicious in the the very first picture. 3. Where is your beautiful head scarf from? I second that emotion, we need a pin curl ANC head scarf tutorial STAT! And where you get scarves on the cute/cheap. Love Mad Men. What iphone Ap are you using in these pics? They look really cool! Glad Irene didn't hit NYC as hard as they thought! We just visited the week before (when there was that string of thunderstorms) but definitely not anything compared to a hurricane. I LOVE your Mad Man look! Please take photos of any more Mad Men locales you happen across! And my mom's trick for good pin curls is a dollop of hair gel in your wet hair before pinning, also my grandmother (Mimi) used to use a bonnet hair dryer! She can still tell you how many curls it took to get her hair-do, and my mom says she used to watch and Mimi could do it without a mirror, just by feel! Also, my middle name is Irene. It was my great-grandmother's name, and I've always been proud of it. I am very annoyed at this hurricane for being thusly named. BOOO. 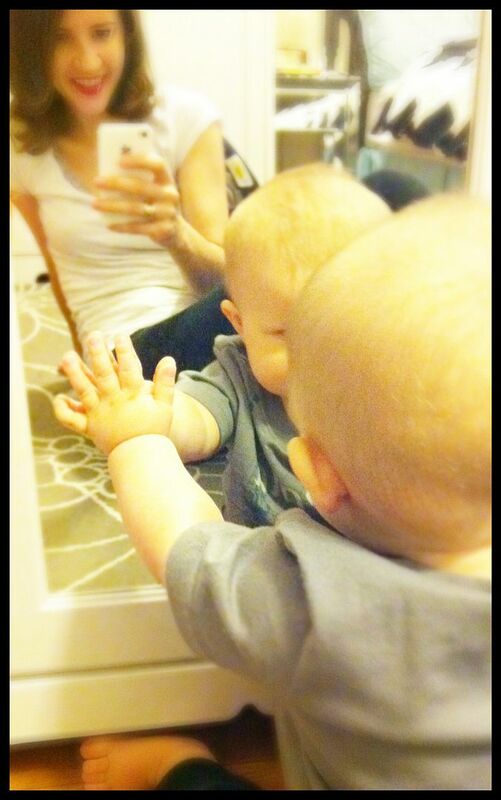 HUCK in the MIRROR! Wonderful, wonderful, adorable boy. Thank you for braving the storm that wasn't! I think you take perfectly lovely i-phone pictures, especially the top left picture of Huck. Also, that's a darling "walking in the rain" outfit... adorable. And how long has it been since you had bright red lipstick? Too long. ps. You're definitely not a Betty, if that helps. I loved candy cigarettes as a kid... so, yeah, I'm totally in. And I love your Mad Men look! What did you do with the back of your hair when you put the scarf in it. I've been trying to figure out how to make mine work like that, but the bad is always a formidable problem. Also, you look very dapper in that fedora.